School started, the weather is getting cooler and the leaves have just started to change. To most this means signs of Fall, but to the high school population it can only mean one thing – HOMECOMING! Oh the memories. Although it has been several years (well…maybe a little longer than that even) since my last homecoming, I can still remember the butterflies of excitement as if it was yesterday. The date. The dress. The hair & of course the homecoming football game! While my days of dresses and butterflies may be gone and I still have another 7 or 8 years until I can relive the excitement through my little ones, that doesn’t mean I can’t start generating ideas now! 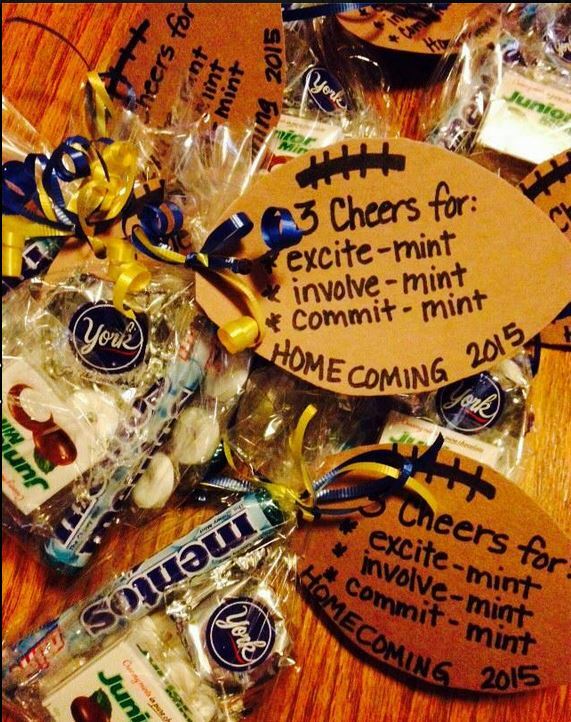 This idea came from a young cheerleader who put these together for her middle school football team! So cute & I love the message she is sending about rewarding involvement and commitment (I mean involveMINT & commitMINT). I am not exaggerating when I say this cake couldn’t be easier to make! Get the step by step instructions here. 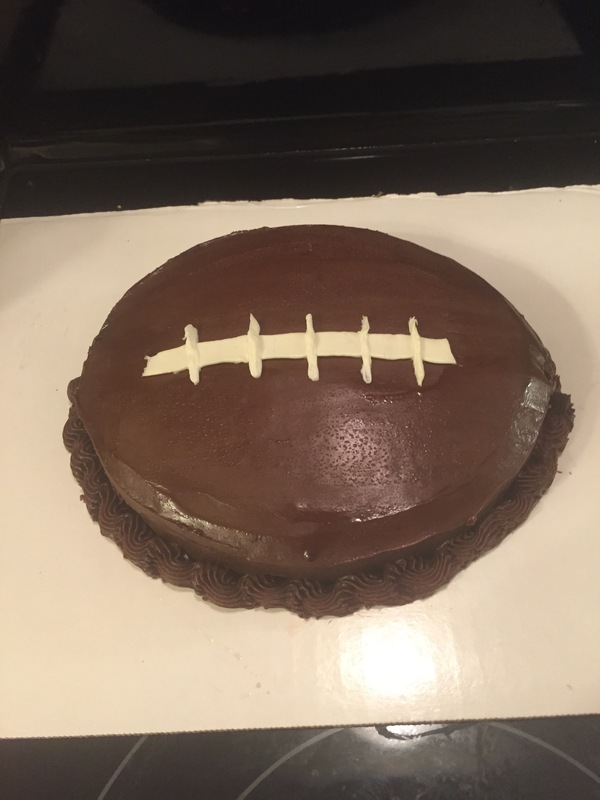 It could be made to hype up the team, for your next football get together or for your little sport nuts next birthday party. 3. Chocolate Covered Popcorn – in team colors of course! 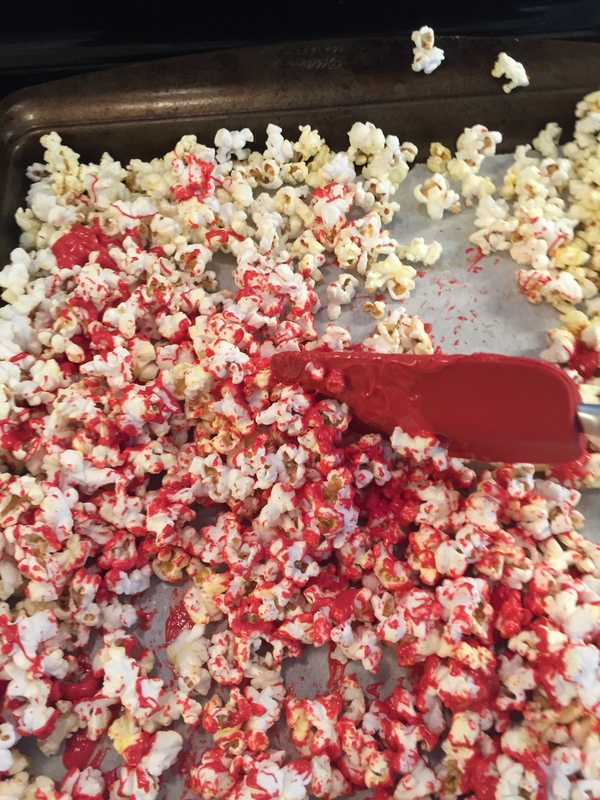 Another super simple, yet fun idea is chocolate covered popcorn in your team colors. Get the step by step instructions here. This is a go to recipe in our house, because everyone loves it and it can be done in different colors to suit almost any event. I absolutely LOVED homecoming when I was in high school, especially the hallway decorating and float contests. Can’t wait to relive it, although I’ve still got another 13 years before that happens. Love how you’re thinking ahead! Love the tags and involve-mint! Too cute! !